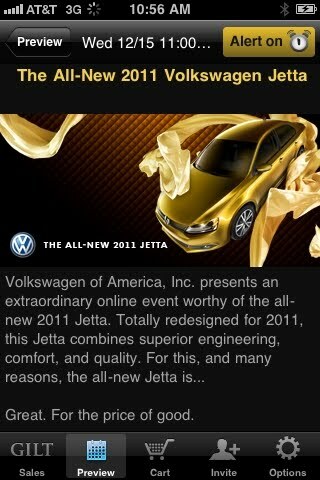 Luxury retail discount site Gilt is selling a few 2011 Volkswagen Jettas for the low, low price of $5,995. 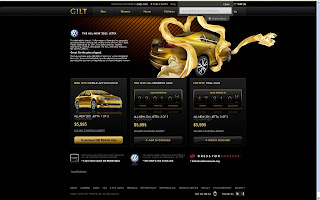 That's right, as part of the launch of the new Jetta, VW partnered with the luxury online retailer to help gain some awareness with the stylish Gilt customer base. If you don't know what Gilt is here is some information from their website: "Gilt Groupe provides invitation-only access to highly coveted products and experiences at insider prices." Basically, the site (and new mobile application) offer discounted clothing, home goods, travel and its first ever car for sale. Brands are high-end labels - think Neiman Marcus or Saks Fifth Avenue customers on a budget. The purchase experience is very similar to American Express when they offered a BMW Z4 for $5k in 2004 during their My Life My Card promotion. Like the American Express offer, the VW sale requires some quick clicking since only 1 lucky person a day for 3 days will get the deeply discounted price. Overall, it's not a bad way to generate some awareness for a new car launch beyond a typical media buy. Plus the Gilt Group's exclusive audience (yes, I've been a member for a few years now) fits the VW Jetta target enough to warrant interest whether the Jetta shopper is looking for himself or one of their kids. Does it only come in that horrible Gold color? That's right, as part of the launch of the new Jetta, VW partnered with the luxury online retailer to help gain some awareness with the stylish Gilt customer base.